There are 38 names in this directory beginning with the letter P.
An award of support like alimony but made to the partner in a dissolved non marital relationship. Where the partners had an express contract, founded on consideration other than sexual services, some courts have held the contract enforceable; where no such formal agreement exists, the court may determine whether the conduct of the parties warrants a finding of implied contract or other understanding to support an award. A paralegal/legal assistant is a person qualified through education, training or work experience to perform substantive legal work that requires knowledge of legal concepts and is customarily, but not exclusively, performed by a lawyer, law office, governmental agency or other entity or may be authorized by administrative, statutory or court authority to perform this work. An exercise of the sovereign prerogative to receive a person from further punishment and from legal disabilities resulting from a crime of which he or she has been convicted. Its effect is that of relaxing the punishment and blotting out guilt, so that in the eyes of the law the offender is as innocent as if the offense had never been committed. In criminal law, a conditional release from imprisonment that entitles the person receiving it to serve the remainder of his term outside prison if he complies with all the conditions connected with his release. 1. A contract of two or more persons to place there money, effects, labor and skill, or some or all of them, in lawful business, and to divide the profit and bear the loss in certain proportions. 2. An association of two or more persons to carry on as co-owners a business for profit. Partners are individually liable for the debts of the partnership, and assets are insufficient. A partnership is not subject to tax; rather the income is divided and taxed as personal income to the individual partners, unlike profits in corporations. The decision whether to form a partnership or to incorporate is generally controlled by the tax consequences. 1. In a judicial proceeding, a litigant (plaintiff or defendant); a person directly interested in the subject matter of case; one who would assert a claim, make a defense, control proceedings, examine witnesses, or appeal from the judgment. 2. A person or entity that enters into a contract, lease, deed, etc. A grant of right to exclude others from the making or selling of an invention during a specified time. It gives its owner a legitimate monopoly. A law to preserve public order that defines an offense against the public and inflicts a penalty for its violation. Statutes that grant a private civil action against a wrongdoer are not considered penal; but remedial, in nature. The criminal offense of making false statements under oath. In common law, only a willful and corrupt sworn statement made without sincere belief in it truth, and made in a judicial proceeding regarding a material matter, was perjury. Today, statutes have broadened the offense so that in some jurisdictions any false swearing in a legal instrument or legal setting is perjury. A written application addressed to court or judge, stating facts and circumstances relied upon as a cause for judicial action, and containing a formal request for relief. Appropriation of the literary composition of another and passing off as one's own the product of the mind and language of another. The offense of plagiarism, known in the law as infringement of copyright, comes into being only when the work allegedly copied is protected by copyright. The one who initially brings the suit. The one who, in a personal action, seeks a remedy in a court of justice for an injury to, or a withholding of, his or her rights. In equity, a special answer relying upon one ore more things a reason for the suit to be dismissed, delayed or barred. At law, broadly, any one of the common law pleadings. Technically, the defendant's or respondent's answer the matter of fact to the plaintiff's petition or complaint. In the criminal procedure, the defendant will enter a plea at his arraignment of not guilty, guilty or in some jurisdictions, nolo contendere or non vult (meaning no contest). The process whereby the accused and the prosecutor negotiate a mutually satisfactory disposition of the case. The defendant may plead guilty to a lesser offense or to only one or some of the counts in a multicount indictment. In return, the defendant seeks concessions on the type and length of the sentence or a reduction of counts against him. Statements, in logical and legal form, of the facts that constitute plaintiff's cause of action and defendant's ground of defense. Pleadings are either allegations by the parties affirming or denying certain principles of law, which are intended to describe to the court or jury the real matter in dispute. An inferior municipal court with limited jurisdiction in criminal cases. Minor cases can be disposed of by such courts, but otherwise they generally have power only to arraign the accused and set bail. Inherent power of state governments, often delegated in part to local governments, to impose upon private rights those restrictions that are reasonably related to promotion and maintenance of the health, safety, morals, and general welfare of the public. In criminal law, the offense of having more than one husband or wife at one time. A lie detector; an electromechanical instrument that measures and records certain physiologic changes in that it is believed are involuntary caused by the subjects conscious attempts to deceive the questioner. Once the machine has recorded the subject's responses to the questions, the operator interprets the record and determines whether the subject is lying. An instrument in writing by which one person appoints another as his agent and confers upon him the authority to perform certain specified acts or kinds of acts on his behalf. The primary purpose of a power of attorney is to evidence the authority of the agent to third parties with whom the agent deals. A previously decided case recognized as an authority for the disposition of future cases. In common law, precedents were regarded as the major source of law. A precedent may involve a novel question of common law or it may involve an interpretation of a statute. To the extent that future cases rely upon the precedent or distinguish it from themselves without disapproving of it, the case will serve as a precedent for future cases. A hearing, before indictment, to determine whether probable cause for the arrest of the person existed; a hearing to determine whether there is sufficient evidence to warrant the defendant's continued detention and whether submission of such evidence to the grand jury is warranted. A written accusation of crime by the grand jury upon its own initiative, without consent or participation of a prosecutor, in the exercise of the jury's lawful inquisitorial powers. The prevailing assumption that the accused is innocent until proven guilty. Because of this presumption, the government bears the burden of proof that the defendant is guilty beyond a reasonable doubt. Latin term meaning "at first view, on its face." Not requiring further support to establish existence, validity, credibility. 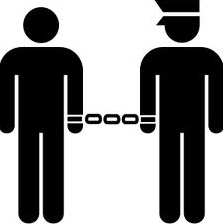 A requisite element of a valid arrest or search and seizure, consists of knowledge of facts and circumstances sufficient in themselves to warrant belief that a crime has been committed (in the context of an arrest) or that property subject to seizure is at a designated location (in the context of a search and seizure). The act of proving that an instrument purporting to be a will was signed and otherwise executed in accordance with the legal requirements for a will, and of determining it validity; the combined result of all procedures necessary to establish the validity of a will. Is a court-order through which an offender is placed under the control, supervision and care of a probation field staff member in lieu of imprisonment, so long as the probationer meets certain standards of conduct. Legal method; the machinery for carrying on the suit, including pleading, process, evidence and practice. The term thus refers to the mechanics of the legal process-- the body of rules and practice by which justice is meted out by the legal system-- rather than the substance and content of the law itself. The succession of events in the process of judicial action; the form in which actions are to be brought and defended, the manner of intervening in suits, of conducting them; the mode of deciding them, of opposing executing judgments. A formal writing (writ) issued by authority of law; any means used by the court to aquire or to exercise its jurisdiction over a person or over specified property; usually refers to the method used to compel attendance of a defendant in court in a civil suit. Every species of valuable right or interest that is subject to ownership, has an exchangeable value or adds to one's wealth or estate. Property describes one's exclusive right to possess, use and dispose of a thing, as well as the object, benefit or prerogative that constitutes the subject matter of that right. The act of pursuing a lawsuit or criminal trial; the party initiating a criminal suit, i.e., the state. Where the civil litigant, or the state in criminal trial; fails to move the case towards the final resolution or trial as required by the court schedule, the matter may be dismissed for want of prosecution or for failure to prosecute. A public official who prepares and conducts the prosecution of persons accused of a crime. In certain cases, the legislator may appoint a special prosecutor to conduct a limited investigation and prosecution. The state prosecutors are usually called district attorneys or county prosecutors. The federal prosecutor is known as the US attorney for a certain federal district. The prosecutor is charged with the duty of seeing that the laws of his or her jurisdiction are faithfully executed and enforced. That which in natural and continuous sequence, unbroken by any new independent cause, produces a event, and without which an injury would not have occurred. A lawyer, usually one holding public office, whose duty is to defend accused persons unable to pay for legal assistance.